Comment: Delivery may take 14 - 28 days. Quality checked pre-owned articles. Media article in excellent condition. For DVDs, please check region code before buying. This is going to be a brief review written in haste to offset the 4 posted reviews that are missplaced; they refer to the Met production with Pavarotti. The Bregenz production is a far different animal, and my 4 star evaluation is based on the overall impact of the production, not a reflection of the singers who, while more than adequate, do not challenge the best of the CD offerings of A.C. (hence, 4 rather than 5 stars). The Bregenz productions take place on a floating stage at the edge of a lake; singers are miked; the orchestra is not visible. The overall impact of a Bregenz performance falls somewhere between traditional outdoor opera and a 3 ring circus production with lots of extras and activity. It is a far cry from the old "stand and sing" approach to opera and, for me, works well as a supplement to more commonplace presentations. 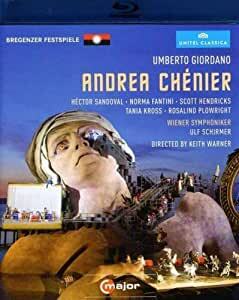 I have seen the Bregenz productions of Aida, Boheme, and Trovatore. (Reviews of those are available at Amazon, but before plunking down the plastic I recommend viewing clips at Youtube to sample them.) My reactions were enthusiastic approval for the Bregenz productions of A.C. and Aida but more tepid for Boheme and Trovatore. Both A.C. and Boheme stick fairly closely to the composer's views whereas Aida and Trovatore strike out in more controversial directions; Aida replaces imperial Egypt with the U.S.; Trovatore takes place at what appears to be an oil refinery and is the least convincing of the Bregenz interpretations (although the pyrotechnics are fun). Back to A.C. (and so much for the promise of a brief review). Like Aida, A.C. has several show stopping crowd scenes and melodramatic confrontations among the principals. This sort of scenary chewing is what the Bregenz folks do best, and they go overboard (literally)with fantastic sets and costumes. The stage is dominated by a giant head of Marat (mimics David's painting of Marat's death in his bath - so the lake becomes the oversized tub). Characters come and go through and around the head. Actions take place on multiple levels. However, intimate moments between characters are often lost because of the large fantastic sets. All in all, this production merits viewing by fans of A.C. It is an enjoyable supplement to the several excellent traditional productions also available through Amazon (e.g., the Carreras and Domingo ones are fine and offer better vocals but not so interesting a production). However, this is an opera and ultimately it is music which makes or breaks the recorded performance. It is here that this BD/DVD fails to distinguishes itself. There are so many good DVDs available for this famous opera and this recorded performance pales besides the top tier of available DVDs. For example, Placido Domingo alone has 3 DVDs to his credit (known to me) and every single one of them towers over this performance musically. Perhaps due to its outdoor nature, the recorded sound is also not ideal. Therefore, I think this is a great reference BD for any student interested in creating an imaginative opera production without betraying composer's intention. However, for a music lover who is looking for a BD/DVD for repeated hearing (and viewing), this just doesn't do.